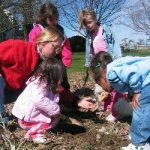 All tours can enrich classroom or home school programs in social studies, environmental issues, New Jersey studies and a host of other topics. We meet many New Jersey Core Curriculum Content Standards. Call ahead to discuss your needs and schedule at 609-924-2310.Inquire Now. Fall is harvest time. 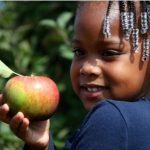 Learn all about our favorite fruit trees- apples! 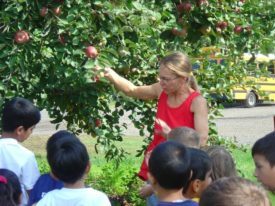 Discussion includes how apple trees and apples grow. We talk about pollination and those busy bees.Visit our apple orchard and pumpkin patch to see these fall crops growing. Allow time to explore the Adventure Barn (a life-size story book, created each year here at Terhune) and corn maze. This program is appropriate for children 3 and up. Tour length 1 hour. All material is presented in an age appropriate manner. Spring is the busy time for plowing and planting in the fields and greenhouse. April through June is the time to enjoy our gardening program. Learn about seeds and how plants grow. Dig for earthworms and learn about their importance. Children will plant mini-gardens to care for at home. This program is appropriate for children 3-10. Tour length – 1 ½ hours. Summer Discover nature on our farm. See how crops such as flowers, blueberries, and apples are developing. 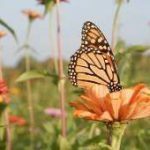 Learn about the importance of water on a farm and life cycle of insects. Children make a pollinator craft to take home. Tour length 1 ½ hours. We recommend nearby Rosedale Park for large groups to eat lunch before or after visiting Terhune Orchards. Please call 609-924-2310 for directions. We are sorry that we cannot accommodate groups for lunch at Terhune Orchards.